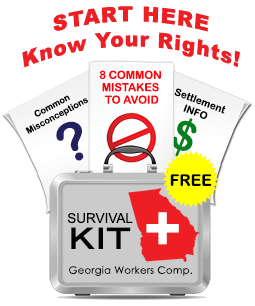 Welcome to the 7th installment of my summer long series on Georgia Workers’ comp case studies. In the following case study, I discuss a recent workers compensation case involving a severe ankle and foot injury. This case involved an ankle injury incurred by woman (Mrs. K) who worked in a warehouse environment. While moving a bulky 250-pound steel panel, Mrs. K and her co-workers paused to rest after moving the steel panel only about 10 feet. The panel became extremely unsteady and fell on her Mrs. K’s foot, snapping and breaking the ankle and foot. Mrs. K was immediately rushed to her local hospital’s ER where she would undergo surgery to stabilize and immobilize the fracture. After her surgery, Mrs. K was referred to a physician from the posted panel of physicians who saw her 3 days after her surgery. Despite the severity of her fracture, the panel physician did not take X-rays to evaluate the union of the bones, nor did he conduct any nerve function tests to evaluate any possible loss of function. Instead he left the cast on and prescribed pain medications. After just over a week living in intense pain, Mrs. K. found me through my web site and retained me to represent her. After reviewing the medical record, it was obvious to me that Mrs. K needed additional surgery and she needed a surgical consult quickly. I contacted the insurance adjuster and persuaded the adjuster to refer my client to a foot and ankle specialist. The foot and ankle specialist diagnosed the foot fracture as a “displaced” fracture, meaning that another surgery was needed and that plates and screws would have to be used to stabilize the foot. This, of course, means that a third surgery likely would be necessary to fully or partially remove this hardware. Because of the delay in getting Mrs. K to the appropriate physician, she suffered complications – ecchymosis (skin discoloration) up the leg to her knee and neuropraxia (loss of nerve function) throughout her foot. In my opinion, these complications would not have occurred, or would have been less severe had the 2nd surgery been performed earlier than it was. Mrs. K is still recovering from surgery. Her job had required her to stand, squat, lift and stand, and she cannot perform the duties of her past job. Rehabilitation is proceeding slowly and I estimate that she will be out of work for at least 6 to 8 months. Mrs. K has not yet had her second surgery and it is not clear to me how invasive that second surgery will be. I expect that we will make a settlement demand either before or after the second surgery. In my view, this is a case in which the insurance company’s delay and their reluctance to get Mrs. K to the right doctor quickly on what was clearly a surgical case will dramatically increase the settlement value of this case. More importantly, I am of the opinion that my client’s health was compromised by the insurer’s delay, not to mention the unnecessary suffering she experienced. I further suspect that had she waited 3 or 4 weeks before hiring me, a second surgery would not have been scheduled as the initial panel doctor seemed oblivious to the severity of this injury. This case illustrates the importance of recognizing that medical treatment under workers’ compensation can be substandard and inadequate. The panel doctor’s motivation and loyalty was not to his patient, but to the insurance company. Ironically, the panel doctor’s failure to act will end up costing the insurance company more money.